Welcome back to another week of Fantasy basketball. There’s just over three weeks left in the regular season, so this is your final chance to raid the wire! This week, the Warriors’ health woes continued as Kevin Durant suffered a rib injury that will sideline him two weeks; Michele Roberts is hoping her contract as executive director of the NBPA is extended; and coach Luke Walton says his Lakers aren’t tough enough. 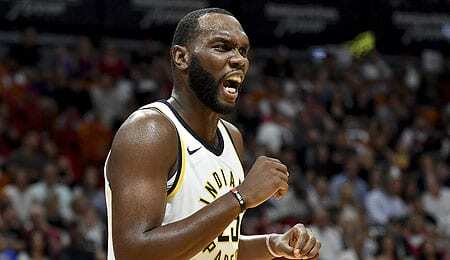 Al Jefferson, C, Indiana Pacers (ESPN: 0.6 per cent; CBS: 2 per cent): Big Al Jefferson hasn’t been a Fantasy factor for a long time, but with injuries galore in Indy’s frontcourt, he got a chance to shine on Thursday, going off for 20 points and 12 boards (including nine on the defensive glass) in 25 minutes. He’s seeing more minutes when he plays this month, but his days as a starter are long gone. Still, with the Pacers’ frontcourt as thin as it is now, Jefferson will be pressed into service. He’s really slimmed down this season, which should help the former franchise player extend his career. Plus, Big Al has that wily vet thingy going on (see video below). Deandre Ayton, PF, Arizona Wildcats (ESPN: NA; CBS: NA): If you’re out of it in your keeper league, it’s time to look to the future. So consider grabbing Arizona big man Ayton, considered the possible No. 1 pick in the 2018 draft. The freshman had a tough shooting game in the first round of the NCAA tourney (6-for-13), but still did his job with 13 boards. Ayton had a hell of a season with the Wildcats, playing heavy minutes, showing a decent outside touch and getting to the line tons while averaging over 20 points and 11.5 boards. Yes, Arizona was stunned by Buffalo, but don’t blame Ayton. He has the size and athletic ability to become an NBA star and he’s already stated he plans to enter the draft. Is Ayton the next Anthony Davis? We’d suggest you pluck him and find out. Nick Young, SG, Golden State Warriors (ESPN: 6.2 per cent; CBS: 8 per cent): Young is another vet that’s enjoying a renaissance thanks to injuries. With Stephen Curry, Klay Thompson and Durant all out, Young has shown he can still get it done, scoring at least 16 points in each of the last two games. Young’s shooting was spotty Friday, but he’s getting so many touches that he’s putting up sweet point totals regardless. His PT is way up lately and he’s been sinking more buckets this month. Young isn’t the three-point scoring machine he was last season, but that’s coming now, too, with three treys in each of the last two. Swaggy P’s minutes should continue to rise for the time being, making him a nice short-term add. Corey Brewer, SF, Oklahoma City Thunder (ESPN: 9.3 per cent; CBS: 7 per cent): Brewer went off Friday for 22 points, six steals, three assists, two treys and a block with zero turnovers in 31 minutes. His three-point shooting has been off the charts lately (8-for-16 over the last five) and his touches are way up this month. Brewer has never been a star, but the veteran seemed to have bottomed out with the Lakers. Since being signed OKC, he’s mostly been used as a starter, revitalizing his career. Wasn’t Brewer just going to be a depth player for the Thunder? This has been a shock, but we’ll give him props: he knows how to win, having been a key cog for Florida’s NCAA championship back in 2007. Andre Iguodala, SG/SF, Golden State Warriors (ESPN: 7.6 per cent; CBS: 13 per cent): Iggy is yet another vet taking advantage injuries. On Friday, he played 31 minutes, contributing 11 points, four boards, a three-pointer and a steal. His shooting wasn’t great (4-for-10), but he’s been sinking more buckets in March. Iguodala even has his most starts (five) since being a full-time starter in his first season in Dub City. If Omri Casspi (ankle) also misses Saturday, Iggy becomes a great DFS play — especially at such a modest price ($4,200 at FanDuel). Devin Harris, PG, Denver Nuggets (ESPN: 0.3 per cent; CBS: 1 per cent): Harris looked decent in his last game, scoring 12 points with two assists and a three-pointer on Thursday, but with Gary Harris (knee) expected to miss Saturday, we’re expecting more. Devin Harris hasn’t seen enough PT to be useful lately; in fact, his minutes have pretty much been on the decline all season, but that could change now. He was actually seeing more touches with Dallas, but since coming to Denver, he’s been exclusively a bench player. Harris could be a sneaky DFS option Saturday, but it’s been a couple of years since he was one of the main keys to an NBA offense. Evan Turner, SG/SF, Portland Trail Blazers (ESPN: 4.4 per cent; CBS: 23 per cent): Even with him returning to the bench, Turner is seeing nice minutes (26 or more in three straight) and contributing on offense (at least 11 points in three straight). Trevor Booker, PF, Indiana Pacers (ESPN: 2.8 per cent; CBS: 12 per cent): Now with his third team of the season, Booker has exclusively been a backup in Indy, but with Thaddeus Young, Domantas Sabonis and Myles Turner all potentially out Saturday, he could have a chance to shine. DFS alert. Joe Harris, SF, Brooklyn Nets (ESPN: 2.4 per cent; CBS: 9 per cent): If Allen Crabbe and Dante Cunningham remain out Saturday, Harris (11 points, six assists, three treys on Friday) will be an intriguing DFS pick.